A major search has been launched for a Malaysian Airlines jet with 239 people on board after it lost contact flying from Kuala Lumpur to Beijing. Airline officials admitted they were concerned for the safety of the aircraft, which was carrying four Americans, two Canadians and seven Australians, as well as passengers from France and China. The Vietnamese Navy confirmed that it had picked up the aircraft's emergency locator signal, which was coming the sea, 153 miles south of Phu Quoc island. Vietnamese navy vessels were sailing to an area south of the Vietnamese Island of Phu Quoc after radar scans reportedly showed the Malaysian jet crashing there. Admiral Ngo Van Phat told the Vietnamese newspaper Tuoi Tre that radar showed the aircraft had crashed into the sea off the southern tip of Vietnam, close to the border with Cambodia. It was hoped the naval ships, along with other vessels, would be able to reach the area before darkness fell, to increase the chances of finding any survivors or wreckage. The signal picked up by the Navy is believed to be the Emergency Locator Transmittor, which can be activated manually by the flight crew or automatically upon impact. 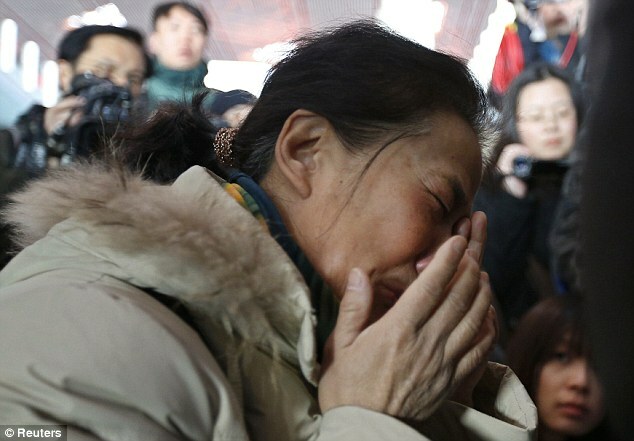 Crying relatives of Chinese passengers on board the plane wept at Beijing airport earlier today as it became clear the jet had probably crashed. An unconfirmed report on a flight tracking website said the aircraft had plunged 650ft and changed course shortly before all contact was lost. The route would have taken flight MH370, a B777-200 aircraft, across the Malaysian mainland in a north-easterly direction and then across the Gulf of Thailand. Those on the flight included an American baby and a Chinese baby, and 12 crew members, Malaysian Airlines said in a statement, adding it was working with all authorities in the region and search and rescue teams had been mobilized. 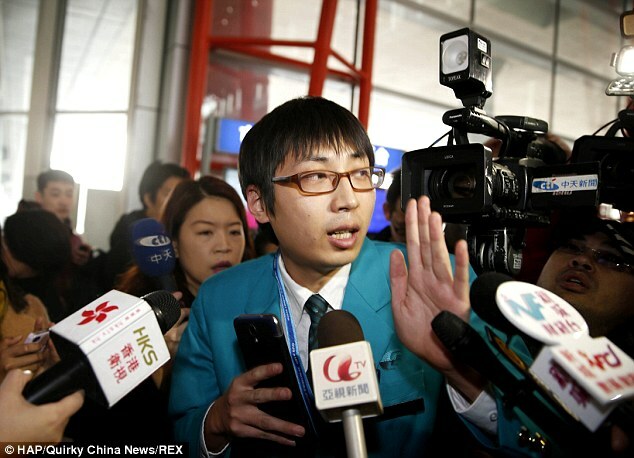 The aircraft had been due to land in Beijing at 6.30am local time but at 7.54am the airline issued a statement saying it had not landed and was officially missing. On board were 153 Chinese, 38 Malaysians, 12 Indonesians, seven Australians, three French, four Americans, two each from New Zealand, Canada and Ukraine, and one each from Russia, Italy, Taiwan, the Netherlands and Austria. The pilot of the passenger plane is Captain Zaharie Ahmad Shah, a 53-year-old Malaysia who joined the airline in 1981. His co-pilot was 27-year-old First Officer Fariq Ab. Hamid, also from Malaysia, who joined the airline in 2007. If the aircraft has crashed, and all the passengers and crew are killed, it would the deadliest aviation incident since November 2001. In that incident, 265 people died after an American Airlines Airbus A300 crashed in Belle Harbor, Queens, after leaving JFK Airport in New York. The deaths included five people on the ground. MAS Operations Control Vice President Fuad Sharuji said: 'We tried to call this aircraft through various means,' adding that it was carrying fuel for 7.5 hours when it disappeared. 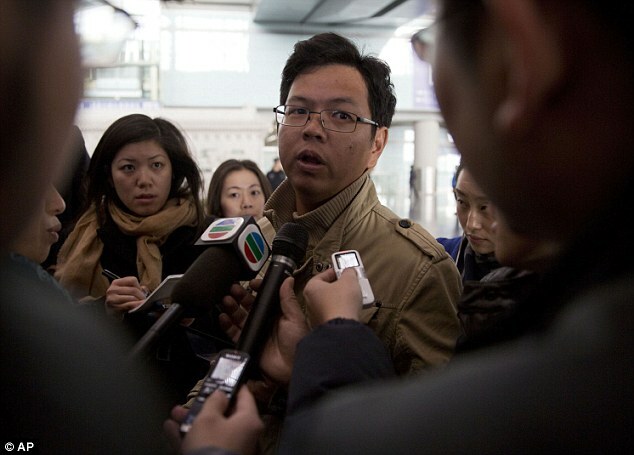 Lai Xuan Thanh, director of Vietnam's civil aviation authority, said the plane was over the sea and bound for Vietnamese airspace but air traffic officials in the country were never able to make contact. The plane 'lost all contact and radar signal one minute before it entered Vietnam's air traffic control,' Lieutenant General Vo Van Tuan, deputy chief of staff of the Vietnamese army, said in a statement issued by the government. More than 10 hours after last contact, officials from several countries were struggling to locate the plane. 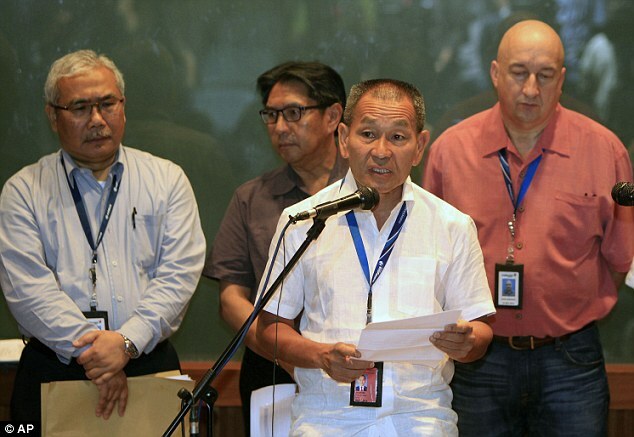 All countries in the possible flight path of the missing aircraft were performing a 'communications and radio search', John Andrews, deputy chief of the Philippines' civil aviation agency, said. Xinhua said China has sent two maritime rescue ships to the South China Sea to help in the search and rescue efforts. 'It couldn't possibly be in the air because it would have run out of oil by now,' Shukor Yusof, an aviation analyst at S&P Capital IQ, said. Aviation experts said that if the report of the aircraft suddenly plunging was correct it could be due to a number of factors. These include a catastrophic engine failure; the pilots taking evasive action to avoid another aircraft; or an explosion. The airline has not said whether the pilots were able to issue a distress call - but if they did not, experts said this could indicate a catastrophy that had occurred without warning. 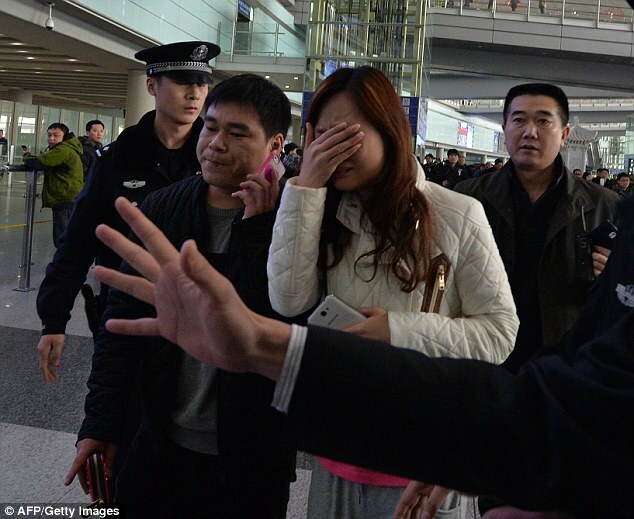 At Beijing's airport, authorities posted a notice asking relatives and friends of passengers to gather to a hotel about 15km from the airport to wait for further information, and provided a shuttle bus service. 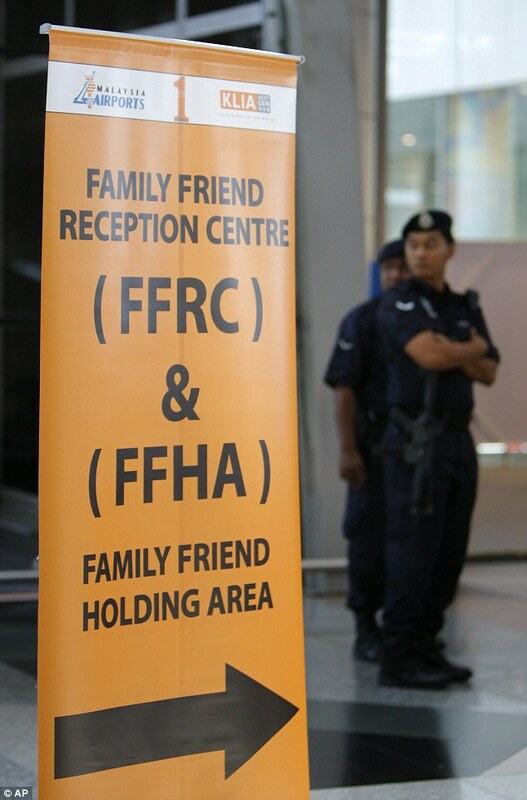 A waiting area for family and friends was also set up at the Kuala Lumpur airport the flight had left from. Fuad Sharuji, Malaysian Airlines' vice president of operations control, told CNN that the plane was flying at an altitude of 35,000ft and that the pilots had reported no problem with the aircraft. The Boeing jet lost contact with Malaysian air traffic controllers a little over two hours into its flight. Reports from China's Xinhua news agency said later that the aircraft was lost in air space controlled by Vietnam and did not enter Chinese airspace or make any contact with Chinese controllers. 'Our team is currently calling the next of kin of passengers and crew,' the airline's chief executive, Ahmad Jauhari Yahya, said as the airline issued a statement saying its 'thoughts and prayers' were with all those on board as well as their families. Finding planes that disappear over the ocean can be difficult. Airliner 'black boxes' - the flight data and cockpit voice recorders - are equipped with 'pingers' that emit ultrasonic signals that can be detected underwater. Under good conditions, the signals can be detected from several hundred miles away, John Goglia, a former member of the U.S. National Transportation Safety Board, said. If the boxes are trapped inside the wreckage, the sound may not travel as far, he said. If the boxes are in an underwater trench, that also hinders how far the sound can travel. The signals also weaken over time. Unconfirmed reports said it was believed the missing aircraft was involved in a crash in August 2012 when it damaged the tail of a China Eastern Airlines plane at Shanghai Pudong Airport. The reports said that in that incident the tip of the wing of the Malaysian Airlines Boeing 777 broke off. Retired American Airlines captain Jim Tilmon told CNN that 'it doesn't sound very good,' as the search continued for the missing jet. 'The route is mostly overland, which means there would be plenty of radars and radios to contact the plane. Ion f*ck wit dem planes, bruh. Call me country, whatever. That's just too many people to be on one damn plane. i hope the the ethnic people are alright, since they are the forgotten ones. Damn. My heart had a pang. Damn... The news is saying its still missing and theyre being reported as being dead? Y'all aren't being fair. An American wrote the article from an American point of view for Americans. I'm sure Australian and Chinese articles of the incident reflect their interests in the tragedy as well. Man, people are so hard on America. This is sad and a little sketchy but no one wants it with China so it was probably just a catastrophe. I hate when photographers take pictures of people mourning, especially when it's fresh. It's so insensitive to me. My God. This is so scary. Bless the people who lost their lives and their families. The media needs to leave those people alone!!! Got them plastered all over the news while they are very upset and devastated! Let them grieve in peace! They were just told the plane with their loved ones is missing and presumed crashed!! I'm praying for the people on board and their loved ones that are left waiting for an outcome to this. I want to hold out hope but we all know what has usually happened when a plane disappears from radar and no contact can be established or hasn't been since it left radar.. This is so sad. I feel for all of the people affected by this. Why are you always starting stuff? That's too many people on one plane so if it crashes too many people are killed. It may not be a logically/statistically sound conclusion but that's what came to my head at the time. Wow, so its just missing? No debris or anything found??? planes of that size rarely crash. it's the smaller planes you have to watch out for. That's not even that many people on a plane of that size. I just checked and a 777 can take over 330 people. This child shows how ignorant she is in every thread. Anyway....they always say how many Americans there were whenever they report something like this. 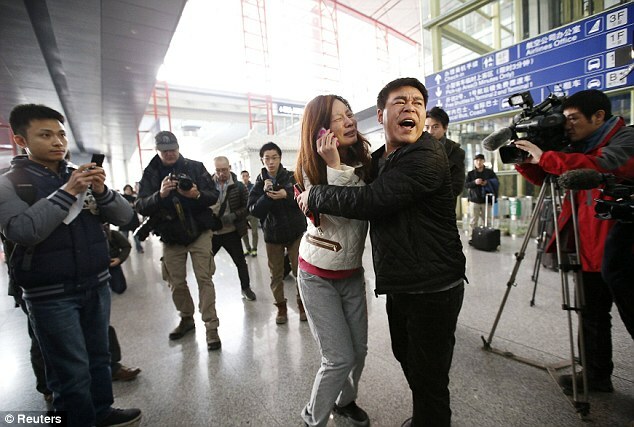 Two-thirds of the missing plane's passengers were from China, while others were from elsewhere in Asia, North America and Europe. Asked whether terrorism was suspected, Malaysian Prime Minister Najib Razak said, "We are looking at all possibilities, but it is too early to make any conclusive remarks." Foreign ministry officials in Italy and Austria said the names of two nationals from those countries listed on the flight's manifest matched passports reported stolen in Thailand. Italy's Foreign Ministry said the Italian man who was listed as being a passenger, Luigi Maraldi, was traveling in Thailand and was not aboard the plane. It said he reported his passport stolen last August. Austria's Foreign Ministry confirmed that a name listed on the manifest matched an Austrian passport reported stolen two years ago in Thailand. It said the Austrian was not on the plane, but would not confirm the person's identity. At Beijing's airport, authorities posted a notice asking relatives and friends of passengers to gather at a nearby hotel to wait for further information, and provided a shuttle bus service. A woman wept aboard the bus while saying on a mobile phone, "They want us to go to the hotel. It cannot be good." "We have been waiting for hours and there is still no verification," he said. The plane "lost all contact and radar signal one minute before it entered Vietnam's air traffic control," Lt. Gen. Vo Van Tuan, deputy chief of staff of the Vietnamese army, said in a statement. 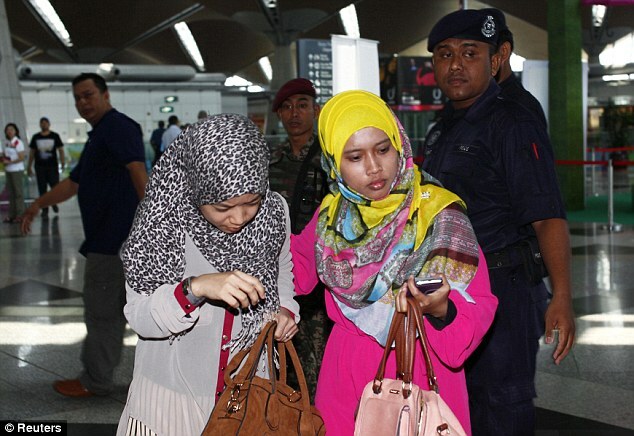 Najib said Malaysia had dispatched 15 planes and nine ships to the area. The U.S. Navy was sending a warship and a surveillance plane, while Singapore said it would send a submarine and a plane. China and Vietnam also were sending aircraft to help in the search. It's not uncommon for it to take several days to find the wreckage of aircraft floating on the ocean. Locating and then recovering the flight data recorders, vital to any investigation, can take months or even years. The plane was carrying 227 passengers, including two infants, and 12 crew members, the airline said. 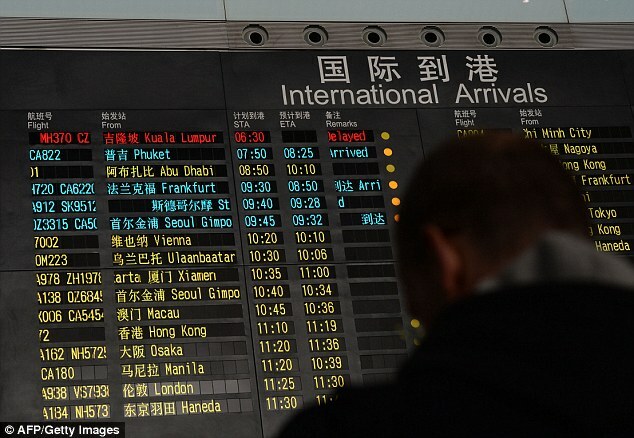 It said there were 152 passengers from China, 38 from Malaysia, seven from Indonesia, six from Australia, five from India, three from the U.S., and others from Indonesia, France, New Zealand, Canada, Ukraine, Russia, Taiwan and the Netherlands. "Our team is currently calling the next of kin of passengers and crew. Focus of the airline is to work with the emergency responders and authorities and mobilize its full support," said Ahmad Jauhari, the airline CEO. "Our thoughts and prayers are with all affected passengers and crew and their family members." 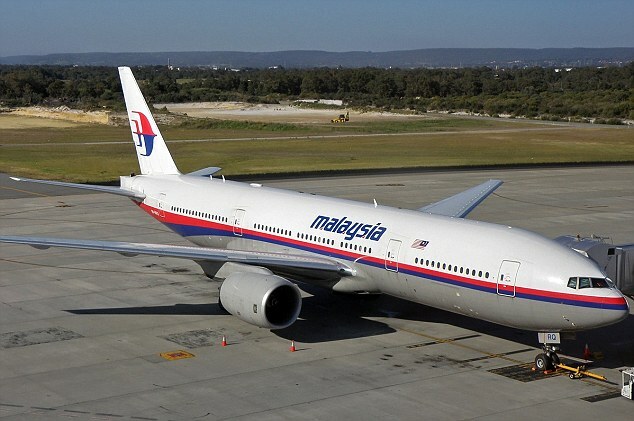 Fuad Sharuji, Malaysia Airlines' vice president of operations control, told CNN that the plane was flying at an altitude of 35,000 feet (10,670 meters) when it disappeared and that the pilots had reported no problem with the aircraft. Airliner "black boxes" — the flight data and cockpit voice recorders — are equipped with "pingers" that emit ultrasonic signals that can be detected underwater. Under good conditions, the signals can be detected from several hundred miles away, said John Goglia, a former member of the U.S. National Transportation Safety Board. If the boxes are trapped inside the wreckage, the sound may not travel as far, he said. If the boxes are at the bottom of an underwater trench, that also hinders how far the sound can travel. The signals also weaken over time. Malaysia Airlines' last fatal incident was in 1995, when one its planes crashed near the Malaysian city of Tawau, killing 34 people. The deadliest crash in its history occurred in 1977, when a domestic Malaysian flight crashed after being hijacked, killing 100 people. 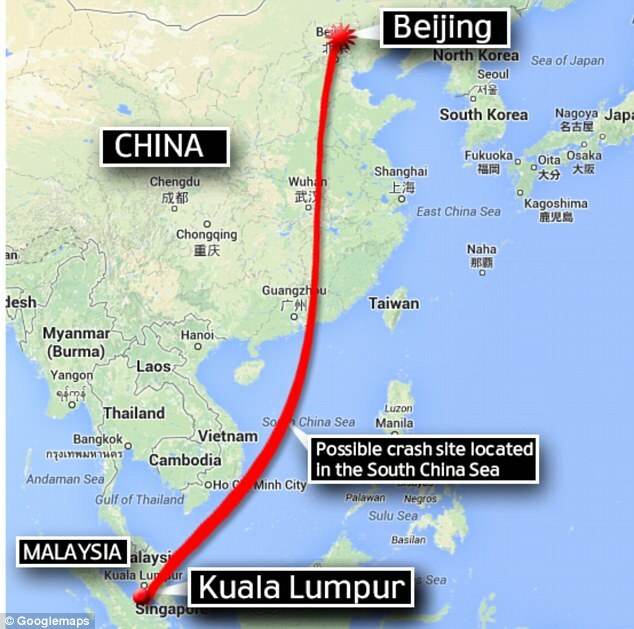 In August 2005, a Malaysian Airlines 777 flying from Perth, Australia, to Kuala Lumpur suddenly shot up 900 meters (3,000 feet) before the pilot disengaged the autopilot and landed safely. The plane's software had incorrectly measured speed and acceleration, and the software was quickly updated on planes around the world. i don't think it's uncommon for people to use stolen/forged passports in certain parts of the world even in this day and age. it might be nothing. but then again, the fact that the plane just fell from the sky with no warning while cruising is defiantly suspicious. Wow. When I saw it on the news first they said the plane disappeared. I am thinking how the f a whole plane?! So the update it was a plane crash. two passengers with stolen passports sat next to one another. its starting to look more and more like a terrorist attack. I don't think that initial headline means anything because anytime a tragedy happens the local news always adds that a local person was among the injured, even if it's 1 out of 500 people, just to emphasize the relevance of the event to ppl who might not care otherwise. It's not that deep. And they bought their tickets at the same time. What's a black box? It's mind blowing how it can just disappear with no trace. I pray for the family members and those involved..this is sooo sad. That wasn't the door. I am sorry but I think someone hijacked that airplane. How does a 777 just disappear? A couple days after the Air France crash seats started floating to the surface but this plane? Nothing. I think so too. Did they kill everyone? Dump some of the oil out and land the plane in some remote area? Then they will later refill the plane and crash it into a building??? I'm reaching...but I do think this was a terrorist attack. Hmmm. Do you think the US or some other country got wind of this potential terrorist attack and suddenly shot down the plane on the DL??? And that explains why there aren't clear answers? There would be debris and the waterway it was flying over is very very heavily traveled. Someone would have seen that. What I am hoping is that it was just hijacked and landed safely somewhere. However a 777 landing "somewhere" with no one to witness is a reach. crash? have they found this plane? 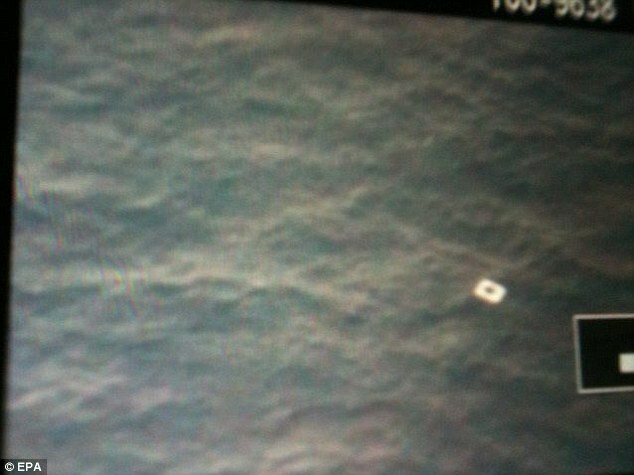 The ocean was much deeper where the air France plane crashed as well. They were confident that finding the plane or signal in the much shallower waters was going to be easier. But not the case. 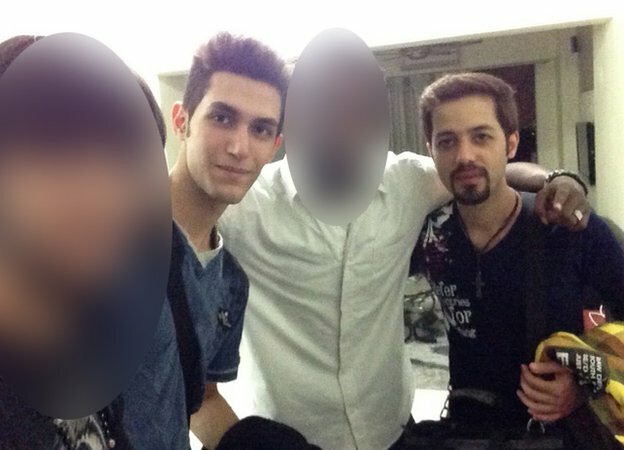 The tickets bought for those with the stolen passports was done so by an Iranian man. I wouldn't be surprised if terrorists are behind this. So sad so many lives lost...no real answers. Can't believe this thing is still missing. It would have to be a pretty sophisticated weapon to leave no trace. one guy was black right? I was thinking a Napalm bomb but that sh*t gets everywhere. Even if it slowly burned some trees or something would be scorched somewhere. I just have to speculate like a mug til we find out . this makes my nerves bad. Is it possible to make a really small nuclear bomb and bring it onboard a plane? How does a damn boeing 777 just vanish... without a trace!?!? Sounded like American propaganda as usual.. So Iranians are getting looked as terrorists? now they're saying the iranians were not terrorists. I was listening to this one guy describing the amount of fraud that takes place with passports. It really doesn't tell you much that fake passports were used. They are used every day because most countries don't check the interpol database for lost or stolen passports. I have heard stories of people in America even using them to travel all over the world, as long as they get a clean one they are usually fine. So they know nothing what's going on, smfh. They are now checking into the backgrounds of the crew members and ONCE AGAIN how does a 777 just disappear? The US Spy Satellites didn't pick up any midair explosions. 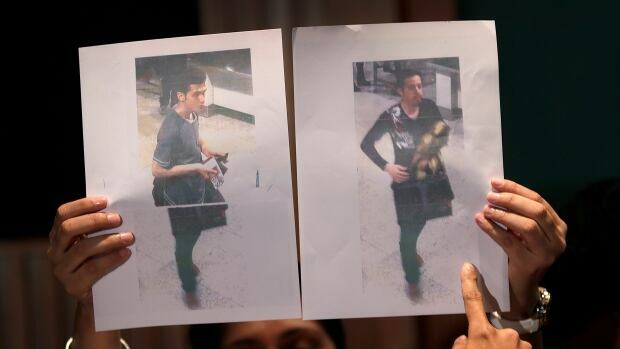 Two men travelling on stolen passports on board a missing Malaysian airliner were Iranians with no apparent links to terrorist groups, officials say. Where's a pic f the Mario balotelli sp lookalike they were talmbout earlier? This is one of the strangest stories I've heard in a really long time. I don't trust or believe much of what these news outlets report as truth because of how self serving these agencies and 'leaders' are so I guess i'll never truly know what happened to those people and that plane. A lot of things are set up as a catalyst for real political agendas in this illusional game of control and power. My mind thinks this way because of past events..
wasn't there a story just recently where a pilot locked his co pilot out of the cockpit and took the plane to a destination of course? Yep. Ethiopian pilot I believe, seeking asylum in Europe. has anyone heard about the alien abduction theories ?